Some households face an "intolerable struggle" as they are living without basic household appliances, a charity has said. 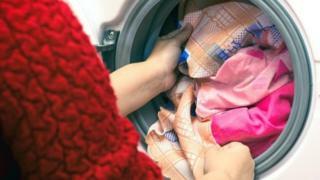 Some did not have the money to buy or replace washing machines, cookers and fridges, the Turn2us charity said. Others rely on high-cost credit, such as hire purchase, to have these appliances in their home. But Turn2us said there was little awareness of charitable grants available to help struggling families. Official figures show that, in 2015-16, the vast majority of households in the UK (97%) owned a washing machine and 93% owned a microwave. Only 56% of households owned a tumble dryer and 45% owned a dishwasher, according to data from the Office for National Statistics. Households spent an average of £2.40 a week on household appliances. However, Turn2us said that many people approaching the charity for financial help in general were going without fridges, cookers and washing machines, or were continuing to use old and dangerous ones. The charity surveyed 2,285 of these visitors to its services and found 15% of respondents did not have a cooker, 16% did not have a fridge, 25% did not have a freezer, and 21% did not have a washing machine. Clifford Moses had a sudden loss of income when an accident at work meant that he could no longer work as a stonemason. The 47-year-old, from Whitley Bay, eventually had to go bankrupt. "My fridge went one summer and I did not have a penny to replace it," he said. "I had to get a cool box to keep the milk in, and had to shop every day." He realised, after doing some research of his own, that grants were available to help those in financial difficulty get hold of environmentally-friendly white goods, allowing him to replace his machine. "I didn't have a clue about it, but it was a gift from heaven," he said. Simon Hopkins, chief executive of Turn2us, said: "Most of us can imagine how a broken fridge or washing machine would be inconvenient or a financial hiccup. But the reality for many households living without essential appliances is an intolerable struggle that's leaving people further out of pocket and in some instances physically and mentally unwell." The effect also went beyond the financial, the charity said. Cleanliness and the stigma of wearing unclean clothes were concerns frequently raised with the charity. Others said they felt they were letting their children down and worried about the effect on them over time. The charity said there was £300m in charitable grants available in the UK to help people in this situation.